The advent of the Internet technology has given rise to the booming of global platform-based economy, which leads to huge revolution in the way of employment. 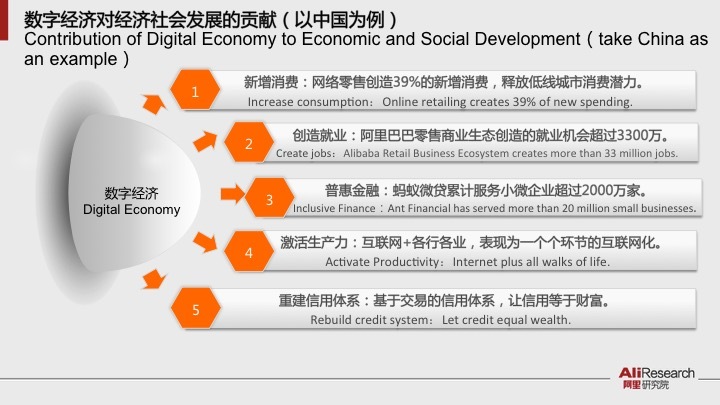 Take Alibaba as an example, its platform ecosystem that is based on e-commerce, logistics, payment and cloud computing has created a large number of flexible jobs and changed the way of employment. In the 2017 fiscal year, Alibaba secured 3.7 trillion yuan in terms of transactions on platforms. Composite estimates by School of Labor and Human Resources, Renmin University of China show that it direct or indirect create 33 million job opportunities. 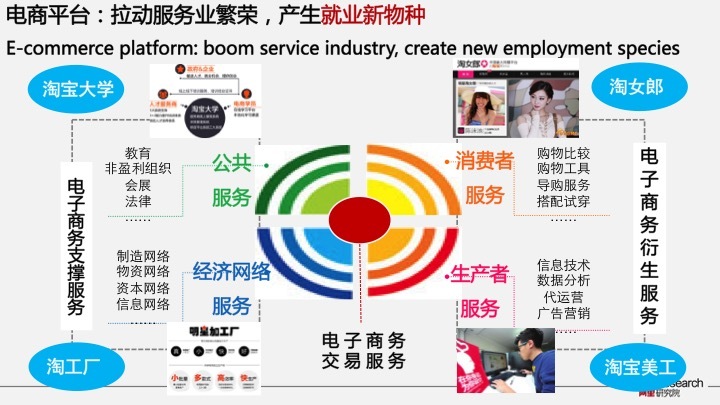 Platform-based employment has specified division of service, extended the coverage of a job market and made employment more inclusive, providing flexible and adjustable "online jobs" for young people, which is also a good source to complement the traditional employment channels. Represented by the Internet economy, new economy is rising based on platforms around the globe. So far, the top 10 global platform-based Internet enterprises have contributed to a gross market value of over 4 trillion USD. Chinese enterprises take up three places among them (Alibaba, Tencent, Baidu), which shape up a "two-wing" structure in the US and China. As platform-based economy is rising extensively around the world, platform-based employment is becoming a new way of employment. (I) Ecologicalization of employment chain. Based on the Internet and big data, Alibaba platform has established new commercial infrastructure that brings more division of labor and more powerful industrial synergy. The Internet platform underpins individualization and flexible production, creating tens of millions of jobs in businesses, plus tens of millions of jobs in upper and lower stream industries like R&D, design, manufacture and after-sales, as well as millions of jobs in supportive service industries. This has shaped up an interconnected, integrated and indispensable ecosystem of employment. Given the Long Tail Effect of the Internet, the list of occupations has been greatly extended. Take e-commerce services as an example, "operating agencies" will provide guidance for online operations. "Online store decorators" who are good at different styles will finish beatifying online store pages within a day. For models for new arrivals, there are more than 40,000 online store models on Taobao, which are further divided into face model, eye model, leg model, hand model and a dozen types more. For new arrival promotion, you can also hire an "Internet celebrity" to do it via live show on the cell phone. In online stores, customer service can be divided into presale consultation, shopping guide during the sales and aftersales service, each with different duties and responsibilities. There are also packers and delivery men. Every evening marks the busiest moment for online stores to dispatch deliveries, and "Taobao Village" distribution center will become a hustling hub. The global largest e-commerce market has given rise to a total new series of jobs. (II) Flexible way of employment. The Internet technology has lifted the space and time limitations for job seekers, who are now able to create value via platforms anytime, anywhere. Even in remote areas, they can obtain global job opportunities via platforms, typically like landlords on the short-term leasing platform Airbnb, engineers on the freelance programmer platform Upwork and car owners on DiDi transportation platform. To provide uninterrupted services around the clock for consumers, Alibaba has promoted the mode of "Cloud Customer Service" since 2010. By mobilizing idle labor in society via platforms, anyone with "One Cable, One Computer and One Hour" can be a member of "Cloud Customer Service” staff. On “Double 11" 2016, "Cloud Customer Service" staff, who were from various parts of China, reached 200,000. (III) Lower barrier for starting up a business. Entrepreneurs used to find a venue and buy equipment before they start up a business. In the era of platform-based economy, everything ranging from computing power, payment, transaction, logistics to factory leasing and supply chain support, platforms will help coordinate and offer. In recent years, the group of "online celebrity" rose among all the Internet startups. By live show on the cell phone, they display and promote products to buyers, and sell a large volume of commodities in a short period of time. Owners of "online celebrity" stores are trendy and good at marketing, but may not understand manufacturing industry and supply chain system. Therefore, it becomes a bottleneck for them to find the flexible supply chain that connects with their tiny, scattered and emergent orders. In 2013 Alibaba launched Taobao Factory platform, allowing "precise matching" between the "production capacity" of factories and sales of sellers. Just like "DiDi Taxi" of the manufacturing industry, the platform will display on a real-time basis the advantageous areas, idle time and handling capacity of each factory for online businesses. So far over 50,000 online brand stores have found processors via Taobao Factory, allowing factories to end idle time and gradually transform from the traditionally "sizable and unified"production to "flexible and customized" manufacture. A number of manufacturing factories that are adjusted to online new economy have been fostered and a platform-based mode of synergy and operation with "online celebrity and factories at both ends" has taken shape. Firstly, inclusive employment covers wider range of job opportunities. Under the mode of platform-based economy, online stores become a key way for university students to start up their own business. A report by China Association of Employment Promotion shows that online stores founded by university students in China account for 60% of the total. The new pattern of platform-driven employment will help disabled persons better integrate into the society and fulfill their own value. A joint report by China Disabled Persons Federation and Alibaba shows that in 2016, Taobao online stores run by disabled persons hit 160,000, with a sales volume reaching 12.4 billion yuan. The new employment mode also promotes gender equality. Among all owners of Alibaba online stores, females take up 49.4%, contributing to 46.7% of the totally transaction volume. Founding an online store has become the top choice of millions of female entrepreneurs. Secondly, flexible employment is narrowing urban-rural difference and helping migrant workers back home for business to eliminate poverty. Taobao Rural partners refers to selected village-level young entrepreneurs who will provide villagers with consumables, help with sales of rural products in cities and assist villagers in services like bill payment. Alibaba platform offers e-commerce training and hardware to Taobao Rural partners. By the end of June 2017, Rural Taobao has set up some 30,000 village-level service stations in 611 counties around 29 provinces. About 50,000 young Taobao Rural partners started their business in rural areas of Shandong, Henan and Guizhou. About 51% of them graduated from junior colleges or higher institutions. Many of them are university students and migrant workers coming home for startups. Luo Sha, a 28-year-old young man of the Dong Ethnic Group in Guizhou, quit his job in Wenzhou, Zhejiang Province, two years ago, and went back home as a Taobao Rural partner. In past years, sweet potato chips, a specialty of the village, could hardly be sold. In last year, he helped local growers sell online. The products were sold out before the Spring Festival. "More and more young people return home. They can take care of elder people and start their own business right at home. "These home-returning entrepreneurs have vitalized the rural areas, and helped local villagers alleviate poverty and become rich. Rural Taobao has covered 178 state-level and 147 provincial-level poverty-stricken counties so far. In Caoxian County, a provincial-level poverty-stricken county in Shandong, villagers follow their leaders and sell costumes online. By August 2017, there have been about 45,000 online stores in the county, involving 140,000 e-business employees. Some 20,000 people have shaken off poverty. Thirdly, diversified employment relieves the "supply-demand" structural contradiction and becomes a “reservoir” for social employment. The report by China Association of Employment Promotion shows that about 50% owners of online stores work part time, while 80% of the employees of online stores age under 34 and 75% of them graduated from high schools and above. E-commerce platforms have set up a stage for young people, so that they can head for their own career and success. In the meantime, the outlook on employment of the young generation has been in constant change. More and more people work on multiple roles. By skill sharing and value exchange on platforms, a person can shift into various occupational identities within one day. Corporate Citizenship Report published by DiDi Company shows that the platform created 17.5 million flexible jobs and opportunities for income in 2016. Among them, 2.38 million came from industries that cut overcapacity and 875,000 from retired or demobilized soldiers. The platform has become an employment reservoir, helping reduce the structural unemployment risks during the key period of transformation. 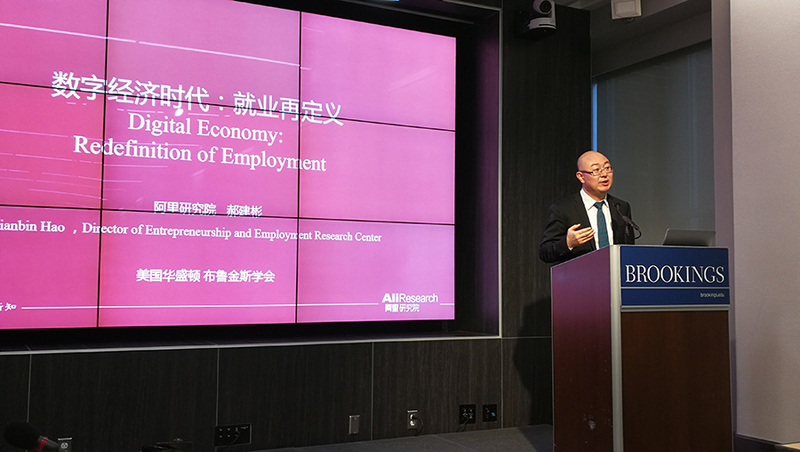 China’s platform-based economy has made certain achievements, but the US is taking the lead in terms of the basics of technical innovation, corporate competitiveness and global influence of platforms. At present, the current employment statistical system fails to measure up the true size of employment of platform-based economy. What’s worse, the existing talent cultivation system does not meet the requirement for the development of new economy, and the labor security system cannot fully cover flexible platform-based employees. 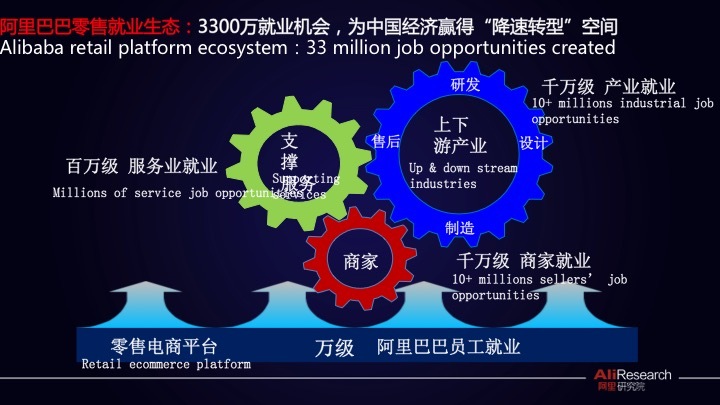 The author puts forward the following suggestions to promote the development of platform-based economy in China and further facilitate startups and employment. Firstly, include platform-based employment into the national employment statistical standard system according to its features. Since platform-based economy has gradually played a key role in supporting employment, it is necessary to include it into statistics for better monitoring of employment situations of the society. The author suggests, as for statistical methods of employment, employment with enterprises can be classified as "platform + individual", so that the statistics can actually reflect individual accounts. In addition, we can adopt statistical means via cloud (cloud computing), end terminal (app), and data (big data). Secondly, set up a talent cultivation system commensurate with the development of digital economy. The author suggests that we should reform the current education systems in universities and vocational schools, and improve digital application capacity of university students and technicians. We should encourage universities to cooperate in education with Internet-based enterprises, and launch advanced courses like AI, cloud computing, and big data in certain universities. Thirdly, innovate social security system to cater for flexible employment requirements. Talents will constantly flow during the times of platform-based economy. The author suggests that we should explore pension, medical and taxation systems across different platforms. By innovating employment security services on the mobile terminal, we should base on the features of platform-based economy and help optimize startup and employment environment for mass entrepreneurship and innovation. Reports say that currently Anhui, Nanjing and Shenzhen have started their exploration. For example, "Sunshine Employment"Online System of Anhui Provincial Department of Human Resources and Social Security joined the "Urban Service" module of Alipay. It allows applicants to handle a series of services online via cell phone anytime, anywhere, covering startup registration and application, employment registration, unemployment registration, application of social security allowance for flexible employment, etc. The innovative social security services have helped employees focus on their jobs without any worries behind.